This WHL season’s new playoff format? Sorry, but it has to go. While out for a walk on Wednesday morning, I stopped to chat with an elderly gentleman. He and his wife are fans of the Kamloops Blazers. And so it came to pass that I tried to explain the WHL’s playoff format. I tried. Oh, how I tried. But how does one explain that if the Prince George Cougars and the Blazers end up tied for third place they might have to hold a play-in game? But, on the other hand, they might not. How does one explain that the Tri-City Americans, who play in the U.S. Division, also are part of the equation? How does one explain what happens if the Cougars, Blazers and Americans all end up tied? How does one explain why the WHL has a playoff format whose first round will include series featuring divisional rivals and series featuring non-divisional opponents? How does one explain why the WHL has four divisions and two conferences and a playoff format such as this one? In the end, I gave up and told my friend to call me on Sunday evening. Hopefully by then the muddy water will be clear again. The Vancouver Giants are four points out of a playoff spot and have only two games remaining. Yes, they will need some help if they are to get into the playoffs. Steve Ewen of the Vancouver Province has more . Like Vancouver, the Moose Jaw Warriors are in a situation where they need to win twice and get some help if they are to make the playoffs. Tonight, the Warriors are home to the Brandon Wheat Kings, who need one point to clinch first place overall. . . . The Warriors expect to have F Tanner Eberle in their lineup, but F Jaimen Yakubowski won’t be there. The 20-year-old is expected to undergo shoulder surgery today. . . . Matthew Gourlie of the Moose Jaw Times-Herald has more right here. The Medicine Hat Tigers are in Saskatoon tonight for a game with the Blades. On Saturday night, the same two teams will meet at the Medicine Hat Arena. It will be the final regular-season game to be played in the 45-year-old Arena, as the Tigers will play out of the 7,059-seat Regional Event Centre that is under construction. I don’t know about you, but life won’t be same without Medicine Hat home games not showing the attendance as 4,006. . . . Daniel Nugent-Bowman of the Saskatoon StarPhoenix reports that Blades G Nik Amundrud (groin) and D Brycen Martin (undisclosed injury) may not play tonight. 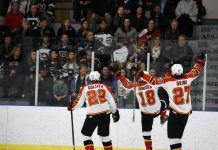 The Calgary Hitmen and Kootenay Ice will finish the regular season by going home-and-home this weekend, starting tonight in Cranbrook and finishing in Calgary on Sunday afternoon. The Hitmen are hoping to finish atop the Central Division — they hold a one-point lead over Medicine Hat — and the Ice would love nothing more than to play spoilers. The Ice will finish in the conference’s first wild-card spot, meaning it will play the Central Division pennant winner in the first round. So this series just might be a first-round playoff preview on top of everything else. . . . Taylor Rocca of the Cranbrook Daily Townsman has more right here. 1. Brandon (2 games remaining) leads the overall standings by three points over Kelowna (2). The Wheaties last finished first overall in 1995-96. . . . The Wheat Kings will meet Edmonton in the first round. . . . In Moose Jaw tonight and a victory gives the Wheat Kings the Scotty Munro Memorial Trophy. 2. Regina (2) will finish second in division. Will meet third-place team in first round. . . . At home to Prince Albert tonight. 3. Swift Current (2) leads Moose Jaw by two points. . . . In Lethbridge tonight. 4. Moose Jaw (2) is two points behind Swift Current. . . . Should the Broncos and Warriors end up tied, there would be a play-in game at the home of the team with the most victories. Swift Current has a 32-31 edge. . . . Moose Jaw entertains Brandon tonight. 1. Calgary (2) has a one-point lead over Medicine Hat. . . . Visits Kootenay tonight. 2. Medicine Hat (2) is one point behind Calgary. . . . Each team has 43 victories. . . . In Saskatoon tonight. 3. Red Deer (2) will finish third in the division and meet the second-place team in the first round. . . . In Edmonton tonight. 4. Kootenay (2) wrapped up the conference’s first wild-card spot. . . . Will meet the division’s first-place team in the first round. . . . At home to Calgary tonight in what could be a first-round preview. 5. Edmonton (2) will finish in the conference’s second wild-card spot, meaning a first-round date with Brandon. . . . At home to Red Deer tonight. 1. Kelowna (2) trails Brandon by three points in the race for first place in the overall standings. The first tiebreaker is victories and Brandon has the edge, 52-51. . . . In Vancouver tonight. 2. Victoria (2) will finish second and meet the division’s third-place team in the first round. . . . At home to Everett tonight. 3. Prince George (2) is four points ahead of Kamloops. . . . Cougars and Blazers play tonight in Prince George and Saturday in Kamloops. . . . Prince George needs one point to clinch a playoff spot. 4. Kamloops (2) is four points behind Prince George in the division and is tied with Tri-City (3) for the conference’s second wild-card spot. . . . In Prince George tonight and at home to the Cougars on Saturday. 5. Vancouver (2) is four points out of the conference’s second wild-card spot and has two games remaining, both against Kelowna. . . . At home to the Rockets tonight. 1. Portland (3) is tied with Everett for first place. Portland has the tiebreaker with more victories, 42-41. . . . Visits Tri-City tonight. 2. Everett (3) is tied with Portland. . . . Will play in Victoria tonight. 3. Seattle (2) will finish third in the division, so will meet the second-place team in the first round. . . . In Spokane tonight. 4. Spokane (3) is locked into the conference’s first wild-card spot. . . . At home to Seattle tonight. 5. Tri-City (3) is tied with Kamloops for the conference’s second wild-card spot. . . . At home to Portland tonight.